Something very special happened at Columbiana Middle School (CMS). 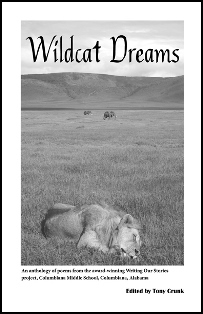 Fifty-eight seventh graders became published writers with their new poem anthology, Wildcat Dreams, edited by Tony Crunk. For the last four years, the Shelby County Arts Council, in collaboration with the Alabama Writers’ Forum and the Shelby County School System, have brought the program Writing Our Stories (WOS) to CMS, the only public school in Alabama to have this pilot program. Led by highly acclaimed poet, children’s author, and winner of the Yale [Younger] Poets Award, Crunk teaches students to believe in themselves that they can write. And they do. 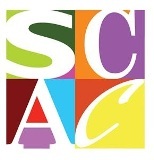 SCAC is committed to bringing the arts to Shelby County student and adults in as many ways as possible to enrich our community. The anthology Wildcat Dreams was presented at a student assembly attended by the student body, family, and friends. Teachers Richard Scott and Elizabeth Birdsong presented the books to the writers. 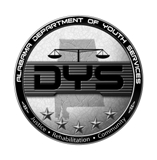 Special guest speakers were Dr. Kerry Rush, CMS principal; Jeanie Thompson, executive director Alabama Writers’ Forum, Inc.; Bruce Andrews, SCAC executive director; and teaching writer Crunk. Students who read their poems from the anthology Wildcat Dreams were Gaylon Beasley, Jeremiah Crenshaw, Emily Dickerson, Tanner Falkner, Hannah-Kate Littleton, Katelyn Lucas, O’Dell Newton, and Taylor Stallworth.